Seng Hout hotel is located in the heart of Battambang city. Our hotel was built in 2008, and rebuilt the hold building in 2016. At our hotel, there are beautiful appointed rooms with cable televisions, air conditioners, refrigerators , and hot and cold water. 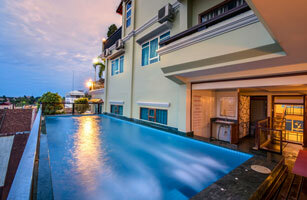 Seng Hout hotel is in a safe, quiet area closed to Psar Nat Market and café area. You can easily access to internet with free wifi. 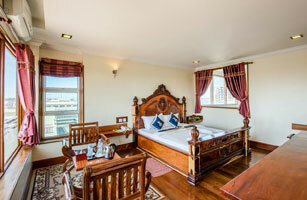 Additionally, rooms are designed with a spacious space overlook the city and the garden terrace. You can relax ,and see the spectacular sunset as you enjoy a drink on the rooftop of the hotel with the views over the city of the surrounding mountains. TripAdvisor loves us and you will too..., if you are looking for a budget Battambang hotel, you need to look no further! Built in 2008, our hotel has beautifully appointed rooms with cable television, air conditioner, refrigerator hot, cold water and you can enjoy with wireless unlimited in your room. Rooms are designed with a spacious space overlook the city and the garden terrace. After along day touring the city; our cable television is where you can water any channels all news and entertainment around the world. The bathroom is equipped with both hot and cool water. Stay in one of the charming hotel in Battambang... we assure that you will enjoy a very special discount everytime when booking online. Battambang is a province of Cambodia. 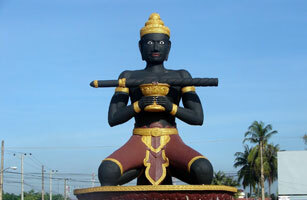 It is in the northwest of the country, and its capital is Battambang. The name literally means loss of stick referring to a legend of Preah Bat Dambang Kranhoung (Kranhoung Stick King). The hotel offers many unique recreational opportunities such as outdoor pool, garden. Whatever your reason for visiting Battambang, the Seng Hout Hotel is the perfect venue for an exhilarating and exciting break away.